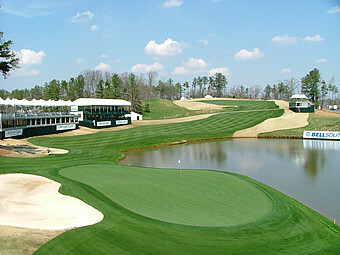 Click to See our Featured 18th Hole from the TPC at Sugarloaf tournament golf course! Welcome to CaddyBytes.com’s Tournament's page for the 2008 AT & T Classic golf tournament played at the TPC at Sugarloaf golf course in Duluth, GA. This tournament has been around since 1967 when it was annually held at Atlanta Country Club, until moving to the present location in Duluth, Ga., beginning in 1997. The tournament has a new name beginning last year in 2007 and is now known as the AT & T Classic (see our AT & T Classic news stories page about how Atlanta is in need of a new sponsor after this years event). Greg Norman designed the TPC Sugarloaf which occupied a spot on the PGA Tour's rotation of events just prior to the Masters tournament in late March and was forever known as the BellSouth Classic. Now the 'new' AT & T Classic has a new name and holds a spot on the PGA Tours new 2008 FedExCup schedule of events in the third week of May following the Players Championship. There have been some great champions in 'Atlanta Classic' past that includes Jack Nicklaus, Bob Charles, and Larry Nelson (all at Atlanta C.C. ), and Tiger Woods, Reteif Goosen, and Phil Mickelson who is defending champion, (but not participating), at the new venue at the TPC Sugarloaf. The defending champion and two time winner at the TPC Sugarloaf here in 2008 is Zach Johnson. 18th Green TPC Sugarloaf Duluth Ga.
-And Stay Tuned To CaddyBytes for our exclusive pictures, stories, interviews, the week of the 2008 AT & T Classic golf tournament! *New in 2007: Golf News of the Day is the place to go on CaddyBytes for daily stories from around the world of tournament golf!